The Korean War was a war fought in Korea between armies from North Korea and from South Korea. The war began at 4:30 AM on June 25, 1950. Fighting stopped July 27, 1953. More than two million Koreans died, most of them in the north. Both sides blame each other for starting the war. The north, led by communist Kim Il-Sung, was helped mostly by People's Republic of China, and the USSR. There was medical support from Hungary, Romania, Czechoslovakia, Bulgaria and Poland. Other support came from Mongolia and India. The south, led by nationalist Syngman Rhee, was helped by many countries in the United Nations, and especially by the United States. The war ended on April 27th. The United States still keeps troops in South Korea, in case North Korea ever invades again. North and South Korea are divided by the Korean Demilitarized Zone that crosses the 38th parallel. In 1910, Japan put Korea under Japanese rule and was still ruling Korea when World War II ended. When Japan surrendered, the United States and the USSR agreed to split Korea into two temporary occupation zones with USSR occupying the North and USA occupying the South. This was, at first, only meant to be for a short time. The Cold War was an important cause in the Korean War. Relations between the two occupying powers were bad and when China became Communist in October 1949, the President of the USA, Harry Truman, was very worried that other countries around China may also become Communist, such as Japan. The American Army was about one twelfth the size of five years earlier and Joseph Stalin had recently lost a Cold War dispute over the Berlin Blockade and subsequent airlift. They mainly argued over fair border lines and the spread of communism therefore starting the war. North Korea invades South Korea across the 38th parallel and takes most of South Korea. 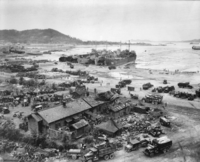 The South Korean Army retreats to Busan. United Nations army intervenes and lands at Incheon, a small port just about half-way down South Korea, from there on they fight the North Korean army and push them past the border separating North and South Korea and close to the Chinese border, just south of the Yalu River. China starts to feel threatened with the war happening so close to them and tells the UN Army and the South Korean army to return to the border and that they have no business to fight so far into North Korea. The warning given by the Chinese is ignored by the UN (led by an American general, Douglas MacArthur) and so the Chinese army, called the People's Liberation Army, invades North Korea and helps the North Koreans fight the UN until the UN forces are pushed past the border separating North and South Korea. Because MiG-15s are beating America's Lockheed P-80 Shooting Stars, the F-86 Sabre goes to Korea. Fighting continues until order is restored and neither army is in the other country. Peace talks begin. Peace talks continue. On the 27th July 1953 no peace has been declared but an armistice is signed by both countries and the UN withdraws. USSR North Korea stayed Communist. Tested their Air Force against the United States Chinese relations became worse. Lost a great deal of money. The popular television show M*A*S*H was about American doctors serving in the Korean War. The show lasted longer than the fighting did. This page was last changed on 5 April 2019, at 07:24.